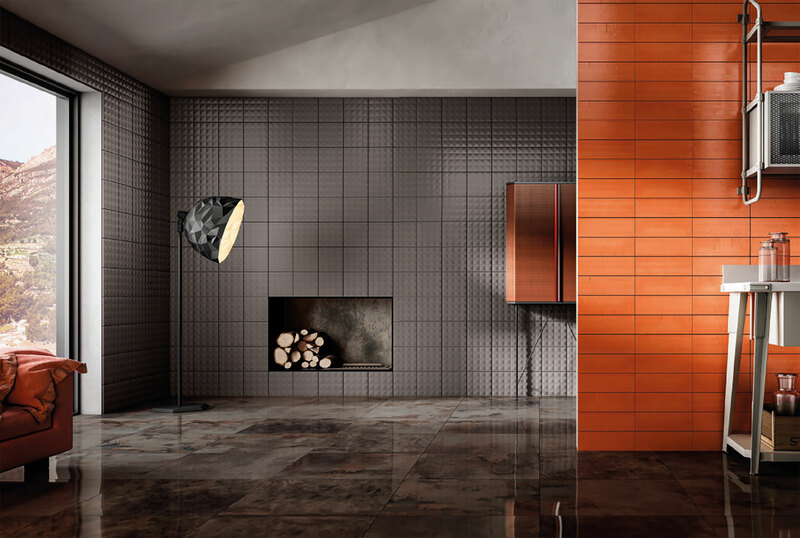 Milan Design Week saw a preview of 5 new collections of exclusive porcelain tiles from the ongoing partnership between Iris Ceramica and Diesel Living. Out of This World is inspired this time by the landscape of Mexico: a strongly expressive world, between past and present, full of atmosphere and marked by co-existing natural and urban contrasts. The world of ceramic surfaces continues to surprise with its technical and aesthetic innovations that make porcelain the most versatile and interesting material in circulation. Thanks to its original and surprising results and its endless possibilities for customisation, porcelain is the material that, more than any other, expresses a contemporary identity, bringing every desire forescapeinto the home, together with an eclecticism that becomes a real trademark. One example is the 2018 proposal byDiesel Living with Iris Ceramica, displayed at the 57th edition of the Salone Internazionale del Mobile in Milan, featuring an "ironic, casual vision of architecture, aimed mainly at the high level contract and hospitality world". With the Out of This World concept, Iris Ceramica and the lifestyle brand Diesel Living continue to increase their range of porcelain floors and coverings. Five new collections were also presented this year at Milan Design Week 2018 at the Rho-Milan exhibition centre, in a “hotel” version (with a Garage Bar and Security Lodge) and in the Pop Up Home in via Cesare Correnti, 14. Glass Blocks, Synthetic Tape, Synthetic Studs, Metal Perf and Cement Mexican are five striking and colourful solutions that join the previous 12 collections, for a further design development in the partnership that began in 2015. Based on the principles of Diesel homestyle, developed through the years in partnerships with leading brands in lighting, objects, fabrics and furnishings (like Foscarini, Moroso, Scavolini, Seletti, Berti and Mirabello Carrara) Iris Ceramica’s 5 new collections explore atmospheres and colours inspired by Mexico. Mexico is a unique country, chosen for its landscapes featuring natural and urban contrasts, the one-of-a-kind perspectives of its deserts and the stronglyexpressive nature of centuries of tradition deeply rooted in folk culture. As in past years, exploring first metropolitan and post-industrial style and then inspired by the deserts of Arizona, for 2018 Iris Ceramica and Diesel Living create "a world between past and present, combining analogue and digital, a land of striking colours and a strong personality". High-tech, high level aesthetic ceramic by Iris was used to create Glass Blocks, Synthetic Tape, Synthetic Studs, Metal Perf and Cement, inspired by glass, concrete and metal. It is a visual exploitation of materials and the energy of a unique covering material that never ceases to amaze for its continual aesthetic innovations, always creating original results that break down traditional boundaries. In the 18 collections by Iris-Diesel Living, the surfaces vary from “heavy concrete to absolute lightness, offering a range of design ideas for strongly contemporary homes”. Another new feature for 2018 is the increase in the range of sizes for Grunge Concrete one of the most popular collections of 2017, now available in a large 300x150 cm size in Rebel Black, Rebel Grey and Rebel White. The potential of Grunge Concrete, a hyperrealist collection popular for its contemporary inspiration of urban concrete damaged by marks, scratches, cracks, peeling and rifts, is now available in maxi slabs that can be used as a design accessory and object.